Tranquil Casa Juanita is situated on a one acre lot in beautiful Marina Chacala, a private gated community with 24 hour security and the best private beach in all of Mexico. It boasts a truly lush garden setting with a private pool amidst a spacious, outdoor tropical living space , in which to relax and read. This is not a crowded setting like so many Mexican homes, but is a spacious compound comprising 3 separate buildings surrounded by botanical gardens and the most beautiful flowers and butterflies of the tropics. The large yellow casita has four bedrooms, each having two double beds, large closets, lock box and ensuites. The ensuites have lovely natural light and large showers that have been decorated in bright Mexican tiles with river rock shower bases. The Master casita, with king size built in bed is situated under a canopy of jungle trees overlooking the ocean. Full width sliding doors open to the balcony. The large ensuite boasts an open air (or closed) shower decorated with hand painted tiles artisanal tiles. The large walk in closet features a lock box and built in drawers. The Palapa is a large open air living space under a multitude of hanging starlights and gorgeous views of the Pacific ocean. There is a diningroom with large table seating 12 and separate living space, as well as a kitchen, den and bathroom. The livingroom features built in Mexican style seating, comfortable chairs, as well as a bar with bar fridge and a smaller dining area for small meals or games. A Bose docking system for your music is also included. Behind a sliding glass wall is the light and breezy kitchen with a fully retractable window to let in the ocean views and breezes. The fully equipped kitchen features a dishwasher, gas oven and cooktop, granite countertops, double sink and a pantry. The pantry houses two refrigerators, open shelving for grocery goods, toaster oven, microwave, granite counter top and extra sink. Off of the kitchen is a small breakfast balcony with lovely ocean views and outdoor seating, as well a gas Weber BBQ. The den features comfortable seating and a television with DVD player. WIFI equipped. Housekeeping is included, cook and full meal service can be provided at extra cost. Guests have full access to private beach club with a large pool, lap pool and kiddies pool as well a large pristine private beach. An Indiana Jones style stone pathway leads you on a 3 minute walk to the beach club under towering trees. Two lighted tennis courts and a pickle ball court are available, close by. For those who want to savour the private tranquility of Casa Juanita, situated among the garden , lush with tropical plants and birds, is a lovely newly built swimming pool , with a kiddies wading pool attached. A true family get away. The property is 90 km north of Puerto Vallarta. Transportation can be arranged. The onsite(concierge)property manager will meet you on the day of your arrival and fulfill all requests. We are a Canadian family of 6, from Calgary, Alberta. Our children now live in cities throughout the world and always love coming to Chacala for a truly laid back, family retreat. This is a tropical garden paradise with a private secluded pool and private beach, lighted tennis and pickle ball courts and perfect weather for fun, fitness and relaxation. Most importantly it is kept to the highest standards of cleanliness in a safe gated compound with 24 hr security. 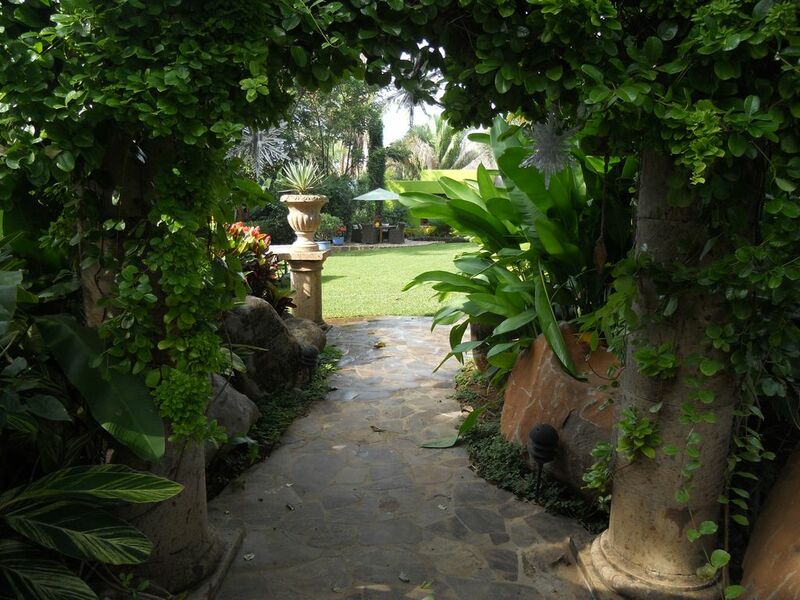 Our guests will enjoy relaxing in a large tropical garden upon entering through a beautiful archway of canterra covered by a mandevillia vine. Daily housekeeping is included, as well a cook can be hired, to make your holiday very relaxing. It is a spacious property with 3 separate buildings. The bedrooms are quiet with solid concrete walls. Butterflies, hummingbirds, chacalaca birds, and a variety of sea birds are constant visitors. Seasonally amazing views of the humpback whales birthing and mating in the Pacific ocean. This property also features a spacious, inviting private pool , with a kiddies wading pool, for those who choose to stay amongst the very private gardens of Casa Juanita. toilet, shower, Bright yellow Mexican tiles with small inlaid motif tiles. toilet, shower, Blue tiled bathroom with sliding doors to outdoor shower. toilet, shower, Green tiled bathroom with windows overlooking garden. Each bathroom has a garden view with spacious showers decorated in colourful Mexican tiles with river stone floors, some with handpainted artisanal tile. It also includes large countertops, storage, sink and toilet. This delightful property is situated in the jungle, 150 metres back from the beach. There is a beautiful and magical hand laid Indiana Jones stone pathway to the beach through lush vegetation. Each bedroom is provided with individual AC units, as well fans.There is also AC/fan in the den/tv room. Housekeeper can wash clothes upon request, for a fee. Outdoor clothes line provided. Dryer can be used by housekeeper upon request, for a fee. Carport style garage for two vehicles. Bath and large beach towels are provided. Large open air living space with beautiful hanging starlights suspending from large palapa. Built in seating for 8, as well 3 comfortable easy chairs. Bar with fridge and glassware.Dining table for 4. This kitchen is well equipped with dishes and utensils for large groups. Napkins and placemats provided. Coolers for the beach. Oversized dining table lighted by Mexican silver stars ,can seat 12 comfortably. Local channels only. Bring Apple TV if you own one. Bose docking system is provided for ipad or ipod/iphone. Scrabble, Monopoly, Chess, checkers, cards and jigsaw puzzles provided. Large garden and lawn with six reclining chairs for relaxing/sun bathing. Water fountain attracts many of the jungle birds. Large balcony off of the Master Casita overlooking the jungle and ocean. Oversized recliner with cushions for reading and siesta. There is also a balcony off of Bedroom 4, overlooking the garden. Large outdoor dining patio with umbrella, seats 6. Two recently renovated tennis courts with night lighting, as well paddle ball/pickle ball court. Private pool in progress., situated in the garden (see photo) Ready for Fall 2018. Features a kiddies wading area, along with a lovely lounging bench in the water, for adults. Large community pool, lap pool and kiddies pool located at the beach club down Indiana Jones pathway(5 minute walk). Private, pristine beach in secluded bay. Private car services, private chef and massage are all available upon request. Each of these services will be charged separate to the rental of Casa Juanita. We had the most incredible family reunion here. Casa Juanita is such a beautiful, inspiring place to be. The housekeeper/cook was so kind and cooked many delicious meals for us. Javier, the house manager, graciously helped us with every question and need. The setting is outstanding. We had 13 of us ranging from 2 years old to 75 and we were all so happy with our stay. We hope to go back soon. Casa Juanita is as close to a perfect large group vacation as you will find anywhere. The accommodation is picture perfect, grounds are beautiful, views of bay spectacular, Ceci the cook is amazing and Javier - local host would fit in at the best hotels or beach resorts in the world. These are amazingly nice and special people. Jane - owner was easy to work with and has created a little piece of paradise. Enjoy the beautiful private beach (no undertow, very safe!) or pool(s), tour the area etc. This is not a location for nightlife though - if that is your thing stay in PV or Sayulita. If you want a great getaway and experience that is both safe and enjoyable, don't hesitate for a minute booking here. Private drivers are easily arranged and where excellent as well. We have nothing but good memories and will be back for sure. Thanks Jane, Javier, Ceci!! Wow!! 5 Stars without hesitation! Don't think twice about booking this vacation home because there is no way you will be disappointed. It is exquisite in every detail. The designer was brilliant, the builder an artist and the decorator, who I presume is Jane, is impeccable in her taste! We're particularly picky about kitchens. We made dinner every evening but one and we rate this one 4.5 stars! Plenty of everything! We couldn't get the oven lit (thus, - 1/2 star) but no problem, there were plenty of large pans with lids so we could cook on the stove top just as easily. The space, inside and out, offers plenty of room for guests (six in our case) to stretch out so we never felt we were on top of each other. Ceci is absolutely charming! She prepared our dinner on the day we arrived. It was so nice not to have to think about anything other than pouring wine, or mixing gin & tonics, and collapsing on the beautiful bancos to enjoy our incredible view of the bay. The meal was delicious! She was also very helpful in general as was the property manager, Beto, who was taking Javier’s place while he was on vacation! We spent much of our time just lounging at the house or Chacalilla beach and/or pool. Beto arranged massages for us with Juan Massa. We drove to Sayulita one day, (justifying our car rental), for lunch and shopping. We walked into town to enjoy the beach twice and found an unusually crowded scene due to the national holiday. It was very colorful, fun, and festive and the water temperature was perfect! We ate (with our feet in the sand, my idea of heaven!) at Chico’s the first time and Tres Hermanos the second, which I think we all liked best. One in our group courageously (?) tried the fresh oysters that are sold on the beach. Don’t do it!! All in all, I’d say it was perfectly perfect! This was the best vacation with our children and grandchildren! The 3 separate buildings worked well for us since some our family was on different time zones - each family had their own space. The common area's offered gorgeous views and comfy furniture. Our cook was amazing - feeding us something different each day! Javier checked in each day to answer any questions and provide tips on what to see. The beach was small but provided snorkeling, soft sand and fun waves for the kids to jump. Everyone is friendly and respectful of the privacy. Gorgeous swimming pool and more comfy chairs. We highly recommend it and can't wait to go back! Breathtaking and totally relaxing beach holiday. Casa Juanita was everything we expected it to be. The weather was beautiful, the private beach was heavenly. The accommodations were very charming, clean, comfortable and quiet. Our group loved the palapa and sitting under the swaying starlights at night. We were looked after everyday by the staff, which helped make it a true vacation for us. We would definitely make a return visit to Casa Juanita in the future. We spent a girls weekend at this beautiful piece of paradise. We felt special from the moment we were picked up at the airport to walking into the private oasis which would be our home for the week. Casa Juanita is an elegant set up with private, nicely decorated bedrooms with showers, to the beautiful palapa that encompasses the kitchen, dining room and living room. The view over the jungle through to the ocean is spectacular. If you need anything to be picked up outside of the compound then the property manager Javier is available. He picked us up more wine and a few items from the grocery store which was so handy. We hired the chef Ceci for the week and she made healthy and very tasty meals everyday. She came first thing in the morning and set up our breakfast, cleaned up the dishes and prepped for our dinner each day. She is well worth the little bit of extra money throughout your stay. Within the compound you have available to you a pool, lap pool, private beach, tennis and pickleball. If you are looking for a place that is quiet yet offers so many options throughout your stay then I would highly recommend Casa Juanita. I have stayed at many resorts over the years and Casa Juanita offered us everything and more that you would get in a resort and it is without the crowds. I hope to be able to return to Casa Juanita in the near future. This property is real Mexico at its best. This spacious and private home incorporates a vast lawn for relaxation or games of volleyball and pingpong. It is surrounded by what the locals call Chacala's Garden of Eden. Beautiful trees, exotic flowers and fruit trees are carefully tended by a full time gardener. Butterflies and hummingbirds abound. Frigate birds soar lazily overhead. Pelican echelons fly by the beach on their way to feeding grounds. The Chacala area is not 'over touristed'. The local fishing village of Chacala (5 minutes walk) has fresh catch restaurant menus, and nice beach settings under the palapas. The hillsides are filled with wild jungle vegetation, and mango and fruit orchards, teeming with colorful birds and flora. Nearby petroglyph ruins rarely visited due to a 45minute hike, are a must see. The private beach in a protected bay is the best and cleanest in all of Mexico, with mild surf ideal for children. Expert surfing is a 5 minute boat ride around the corner of the bay. Whale watching offered by the local fishermen, as well as fishing, are favorite activities by our visitors. The Beach Club has 3 pools, one a wading pool for toddlers. There are two finely maintained tennis courts as well as a paddle ball/pickle ball out door court. There are many local trails for hiking that residents use daily.